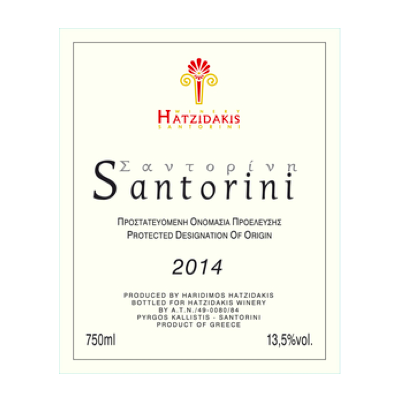 Santorini 2014, PDO Santorini, Assyrtiko 100%. Grapes from the vineyards of villages: Pyrgos, Megalochori, Akrotiri and Vourvoulos. Vinification: Direct separation of must from grapes, clarification and fermentation with indigenous yeasts at 18 °C. Stay with the Lees for 40 days. Maturation in stainless steel tanks. Characteristics: Soft yellow colour with golden shades and delicate aromas of citrus, white flowers and minerality. Full and aromatic on the palate with an intensive mineral character. Long aftertaste with a certain freshness coming from the crunching acidity of the wine, which is typical of the vineyards of Santorini. A versatile wine, matching seafood, oily fish e.g. salmon and shellfish, yellow cheese, chicken, pork and a variety of dishes, even tomato and asparagus. Served at 12-14˚C. Potential aging in the bottle for at least 5 years.